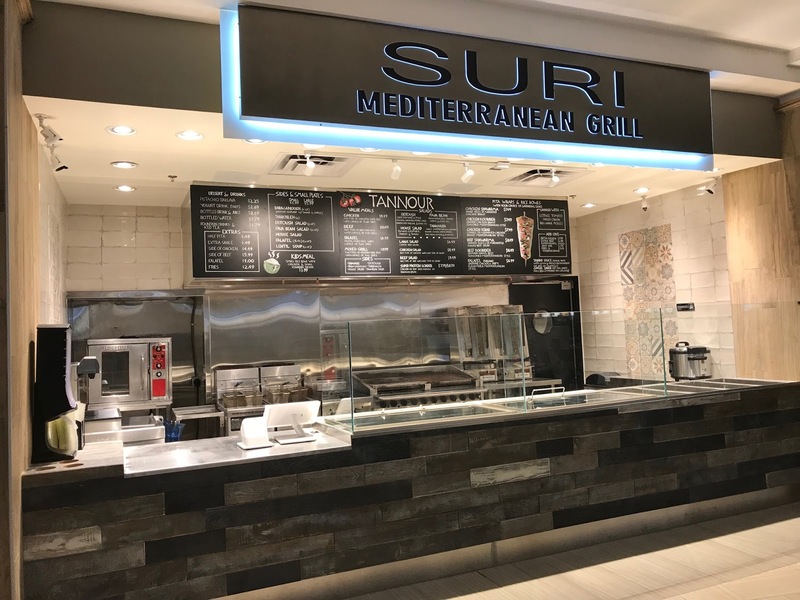 A new quick-serve restaurant called Suri Mediterranean Grill opened Tuesday in the food court of Perimeter Mall in Dunwoody. The restaurant, which replaced Subway, features classic Medterranean fare such as fattoush salad, falafel and shawarma. Although Great Wraps Grill continues to operate in the mall, for some, Suri may fill the void left when longtime Mediterranean mall eatery Hovan Gourmet closed in early 2013 after 35 years. Hovan later reopened in Old Five Points shopping center in Brookhaven. Fitness facility Fit9 plans to relocate from Andrews Square to 3231 Cains Hill Place, formerly home to Range boutique. The move is reportedly due to noise complaints from tenants below Fit9. Both spaces are owned and managed by real estate firm Edens. A new location of Lennys Grill & Subs is opening on Johnson Ferry Road across from the new City Springs development in Sandy Springs. California-based Poke Bar will be opening a second Sandy Springs location later this summer when they debut at Fountain Oaks shopping center on Roswell Road. The new poke shop will open in place of Wok & Roll Chinese restaurant in a 1,388 square foot space adjacent to the upcoming Frutta Bowls. The first Atlanta area Poke Bar opened in Abernathy Square in the former Seven Hens in late 2016. As we reported last week, a new Poke Bar is also opening in Atlantic Station. Nashville based off-price retailer Bargain Hunt, with stores in Austell, Kennesaw and Douglasville, among other OTP locales, has adjusted their store's pricing policy. Whereas before the store featured a policy similar to defunct retailer Filene's Basement, where merchandise was reduced further every month that it remained on the sales floor, the retailer's new policy is more akin to competing retailers Ollie's Bargain Outlet and Big Lots where merchandise comes in "discounted" and may be marked down further the longer it stays in the store. CaJa Popcorn at Peachtree Battle shopping center in Buckhead quietly closed February 28. The closure seemingly went unnoticed and unreported for nearly three months. A sign posted to the door reads: "We are very thankful for all of our customers who have popped into CaJa Popcorn over the past 5+ years. As we think about the next stage for CaJa we are closing our Peachtree Battle location on February 28th and hope to pop up soon in a location that better meets our growing retail, wholesale, and corporate event requirements. Thank you again for your a-maize-ing support!" SweetWater Brewery plans to convert its existing tasting room on Ottley Drive in a bar & restaurant. After about three years in business, Taziki's Mediterranean Cafe has closed its location on West Ponce de Leon Avenue in Decatur. A number of locations of the Birmingham-based franchise continue to operate around metro Atlanta. Taziki's locations remain open in Toco Hills Promenade, Lenox Square's Fashion Cafe (food court), Sandy Springs, Kennesaw, Alpharetta, Suwanee and Athens. Real estate sources indicate that other locations may close, as the concept has not performed as well as had been expected locally. Taziki's is owned by Nashville-based Fresh Hospitality. Tam Sung, a new Thai restaurant on Roswell Road in Buckhead, has seemingly closed after only a couple of days in business, according to local sources. The restaurant, located at 3226 Roswell Road near Buckhead Village, was announced to be 'coming soon' last year, opened briefly earlier this year, but has sat idle for months with a paper sign in the window saying "today closed." One local source claims the restaurant was shut down due to complaints of it operating illegitimately as a nightclub/lounge instead of a restaurant, but peeking inside the restaurant's window seems to reveal a restaurant, not a club. Multiple attempts to contact owner Danny Song of Little 5 Points' Thai 5 Atlanta for comment on the status of the restaurant were unsuccessful. Early Tuesday, it was announced that Marvin Ellison, CEO of struggling department store J.C. Penney, was stepping down to take the CEO post at Lowe's. Ellison, who holds an MBA from Emory's Goizueta Business School, previously worked more than 12 years at Atlanta-based Home Depot, including serving as executive vice president of U.S. stores. Tiff's Treats will open their sixth overall Atlanta area location Saturday June 9 in the street level retail of the new Hanover Buckhead Village high rise apartment building in Buckhead. Austin, Texas-based Tiff's Treats has existing Atlanta area locations in Alpharetta, Midtown, Decatur, Cumberland and Perimeter. Eli, I'm disappointed in your snarky commentary regarding Caja Popcorn. The store was a lovely addition to the neighborhood and had a dedicated clientele who were saddened by the closure but didn't feel the need to make a big deal out of it. I'd feel a lot better about reading (and contributing) to your blog if I know you have your heart in the right place regarding small and local businesses. Jill, Thank you for your comments. I appreciate you as a reader and contributor. You are right, the language here was a bit snarky and was perhaps in poor taste. I'm not a fan of failure in business but in this case I failed. The post has been updated. That being said, Caja Popcorn was DELISH and I plan to use them for various catering events, both personal and professional. Their product is far superior to Garrett's IMO. Yes the original post got me so heated I almost popped!!! Keep up the great work! Please refrain from corny puns in the comments. Oops . . . I noticed a large STOP WORK order on the Thai restaurant the other day. I wonder if any permits were ever granted for the remodel. I for one would like it to reopen. My last meals at Annie and Bangkok Thyme were awful..
Oh my goodness Jill, put your big girl pants on and get some thick skin! #donthurtmyfeelings ... Come on over to college park and you'll see the real world! No time to cry remember "sticks and stones ..."
Jill can you buy me some of that "DELISH" popcorn please? I can only buy the Aldi brand and the Kroger brand on a good day. Bargain Hunt is coming to Fayette(ville) Pavilion soon too!